Silver Maple Tree is one of the most common deciduous trees in North America. Silver Maple Tree- Acer saccharinum, more commonly referred to as the Silver Maple Tree, grows into a lush, green centerpiece for any property. The best part of this tree is you don't have to wait long for it to achieve its thick, leafy appearance as it is a fast-growing tree that can reach between 50 to 80 feet. Its name is derived from the silvery gray bark it has when it is a young tree. It grows well in urban and suburban environments and can even thrive in drier soil. Silver Maple Trees are also great for attracting wildlife, like quail, squirrels, finches, and chipmunks eat its seeds, while birds like blackbirds and starlings nest in its branches. Silver Maple Tree is one of the most common deciduous trees in North America. It is native to just about everywhere east of the Mississippi River, from the Florida panhandle into Canada. The Silver Maple is one of the fastest growing deciduous shade trees available and is a frequent purchase for residential and commercial landscaping. The familiar five-prong leaves easily identify the Silver Maple with broad, angular notches in between. The Silver Maple is distinguished from other Maple trees by the slight silver coloration on the underside of the leaves and the bark on the trunk. With the slightest bit of wind, the tree will appear to glimmer in the sun from this unique coloration. Silver Maples produce clumps of leaves that can be red, yellow, or green and provide a colorful assortment in the spring. The Silver Maple is relatively tolerant of soil types but prefers fertile, moist soil that is slightly acidic. 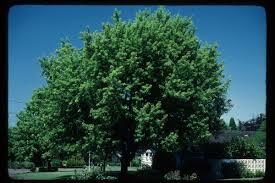 Silver Maple Tree are also resistant to drought and flooding once they establish a firm root system. 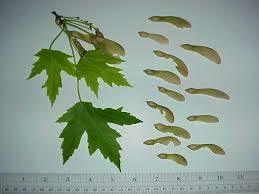 Silver Maples produce the most important seeds of all Maple varieties. Each seed is accompanied by a pair of three-inch wings that provide a means of propagation. Like other Maple trees, the Silver Maple tree’s sap is a highly sought commodity and is recognized as sweeter than that of different Maple varieties. Its acceptance of various soil types, quick growth, and the desirable sap has made the Silver Maple a staple yard tree for hundreds of years. One of the most common trees you will find is the silver maple tree. Silver Maple Tree is among the more attractive you will see. The leaves on this tree are maple leaves which are leaves that have a triangular shape with points surrounding it. These leaves are otherwise quite attractive. They are green for most of the year but change to yellow during the fall months. Its trunk is quite narrow and is among the thinnest compared to other trees. When looking to make this tree as part of your landscaping, it can be placed in either your front or backyard. However, it is crucial that you have a large enough yard, as it will need some space to grow and develop. It can grow in a wide variety of soil conditions and is quite adaptable. In the late part of the spring, this tree will have beautiful green foliage that has a silver tint to it when the sun hits it just right. 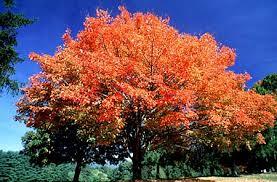 However, when fall arrives is when this tree truly shines. The transformation into oranges and reds makes this an excellent choice for fall color.